On Wednesday, the Federal Reserve Board released its April 2019 Beige Book update, a summary of commentary on current economic conditions by Federal Reserve District. The report included several observations pertaining to the U.S. agricultural economy. 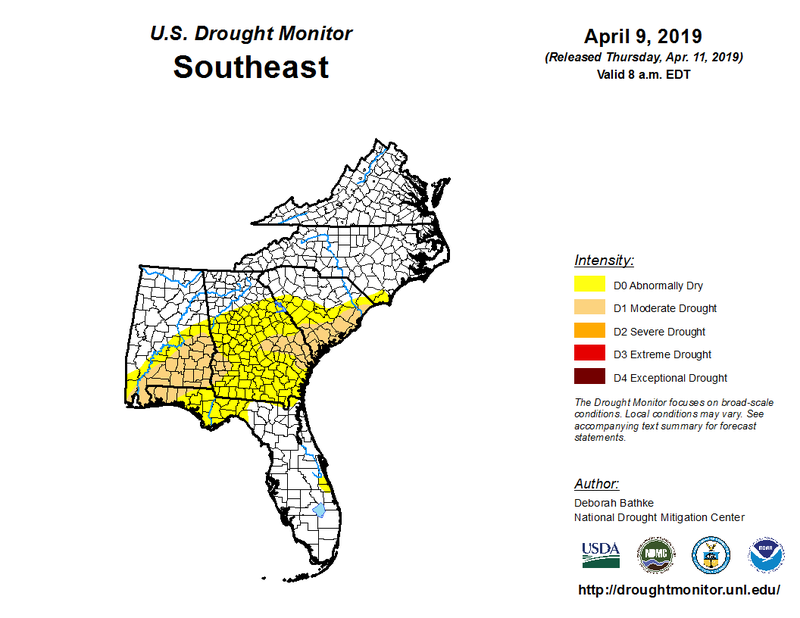 United States Drought Monitor (April 11, 2019). * Seventh District- Chicago– “Farmers continued to be challenged by low corn and soybean prices. Flooding—primarily in the far western parts of the District—destroyed some farmers’ stored crops and was likely to delay fieldwork. Contacts said they were hopeful for a resolution to trade disputes with China and a subsequent pickup in exports. Expectations of a future price rally led many farmers to continue to hold on to crops from last year’s harvest and to delay entering into contracts for this year’s harvest. 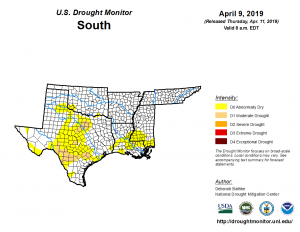 * Eighth District- St. Louis– “District agriculture conditions have declined modestly since the previous reporting period and the same time last year. District cotton and corn acreages are expected to increase from last year by 12 percent and 4 percent, respectively, while rice and soybean acreages are expected to decrease by 1 percent and 6 percent, respectively. 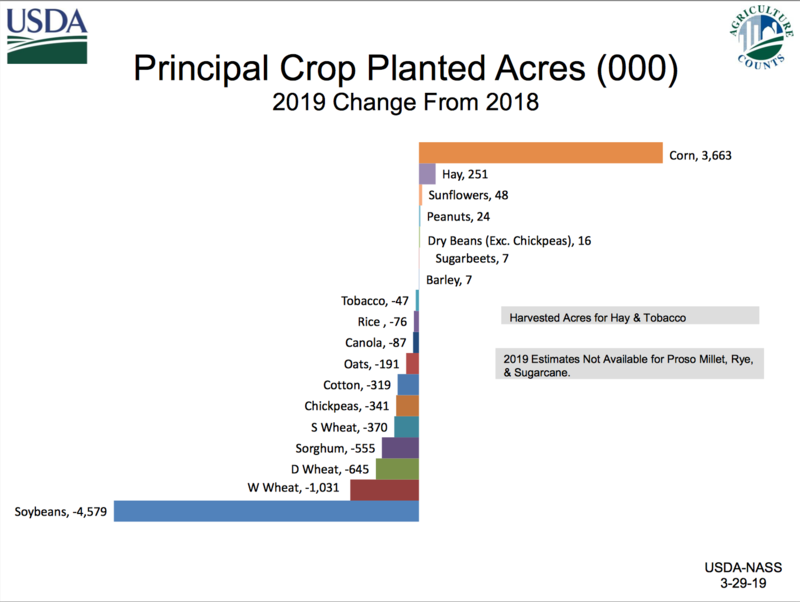 This reflects reports by contacts that continued trade conflict with China has caused growers to shift production from soybeans to other crops. 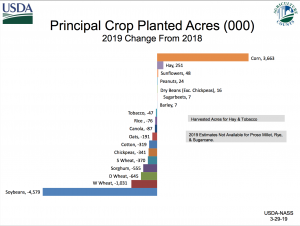 United States: “Prospective Plantings, Grain Stocks, Rice Stocks- Executive Summary,” by Lance Honig, USDA- National Agricultural Statistics Service (https://bit.ly/2HNiXV1, March 29, 2019). 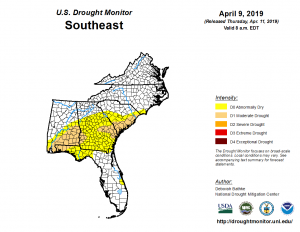 * Tenth District- Kansas City– “The farm economy in the Tenth District weakened slightly from the prior reporting period, and severe weather conditions could weigh on the outlook moving forward. Across the region, corn and wheat inventories were slightly higher than a year ago, and prices for corn and wheat were slightly lower. Soybean inventories in the District were significantly higher than a year ago, with prices moderately lower. 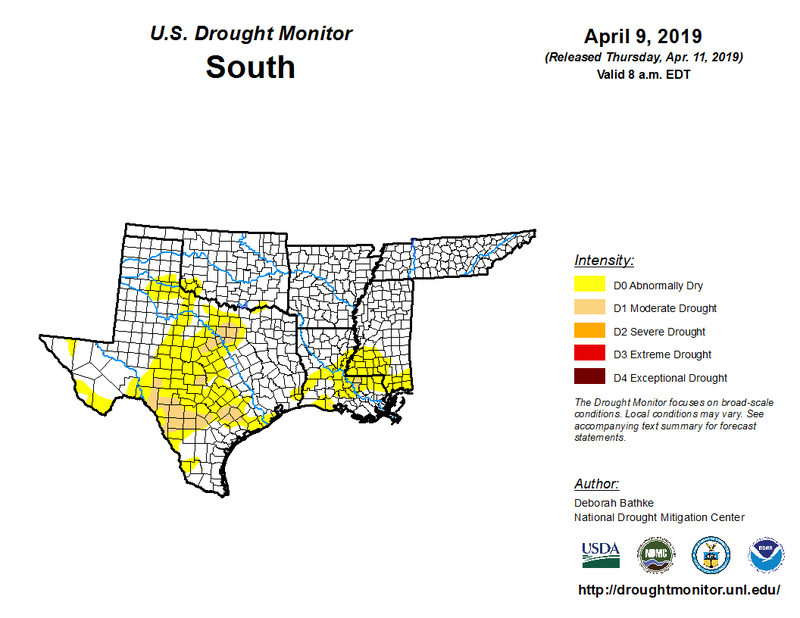 * Eleventh District- Dallas– “Soil moisture was mostly adequate, and there was a surplus in some areas, particularly the eastern part of the state. * Twelfth District- San Francisco– “Conditions in the agriculture sector deteriorated somewhat. Many contacts continued to report that trade policy tensions and a stronger dollar constrained sales to export markets. A contact in Idaho noted that crop inventories rose to record levels as farmers waited for a resolution to trade negotiations and a recovery in various market prices.